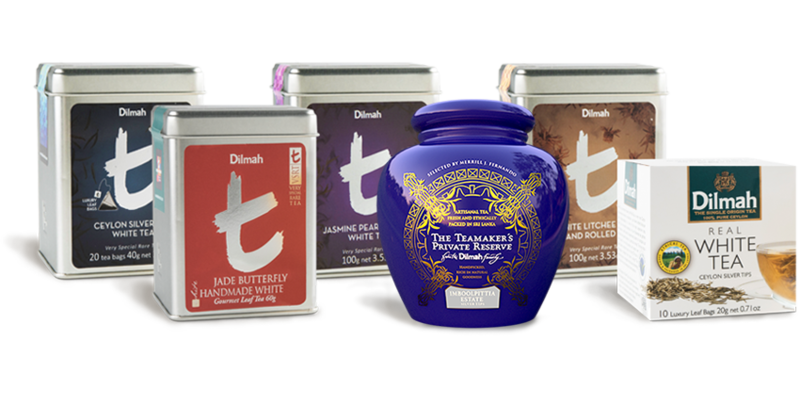 Pure White Tea, handpicked and handmade for you by family tea company, Dilmah. White is the colour of innocence, purity and goodness. And so it is in tea. Real White Tea, made from the tender bud of a special variety of the tea plant, Camellia Sinensis, is handpicked before the sun rises. As a family company with a commitment to sharing with discerning tea drinkers, the authentic, healthful and sensual experience of Real Tea, we bring you genuine White Tea. On account of its rarity, it is a very exclusive tea that is available only in selected places. Yet it is an experience that must be savoured even once in a lifetime. Ceylon Silver Tips, commonly known as White Tea, is a very rare Ceylon tea, entirely handmade and extremely limited in production – just a few hundred kilos per year. Please contact us or visit our online global shop to purchase this very special tea. Complex, elegant perfection of White Tea - the rare Ceylon Silver Tips, made from the hand-picked buds of Camellia sinensis only - gently infused and served chilled and sparkling in a champagne flute. This sophisticated tea is beautifully paired with a fresh Nuwara Eliya strawberry to express its flavour more vividly in the pairing. After the first sip of champagne, a sip of our Cuvée Craighead Estate - Extra Fine Ceylon Silver Tips presents the fruity personality of the tea. The bud of the Camellia Sinensis plant, from which Dilmah White Tea is produced, is known to contain the highest levels of antioxidants called polyphenols. Clinical studies have shown that the healthful, antioxidant activity of tea polyphenols emerges as the most important factor that reduces the risk of degenerative diseases such as heart disease, high blood pressure stroke, cancer, diabetes and oxidative stress. The appearance of genuine white tea is remarkably different to other teas. There should be no processed tea leaves in white tea for Pure White Tea can only be made from naturally sun dried buds of the special cultivar of Camellia Sinensis. They are silvery white in colour with a fine, downy texture. When immersed in hot water and prepared in the suggested manner, they produce a pale yellow tingle in the water with a similarly subtle flavour.